Many players want to know, how to fix the trophy position on the serve. So, in this article, I aim to answer that question. And more specifically, how to fix one of the most common problems I see with a lot of players trophy pose. Elbow positioning. A lot players struggle to keep their elbow up high enough in their trophy position. And it can be tough to fix. Mainly because it’s hard to always be self aware of where your elbow is in space, in relation to your body. It’s very easy to look at another players trophy position and notice if their elbow is too low. But as for your own trophy position, you don’t have the luxury of viewing it from an outside perspective whilst you’re serving. However, just because it’s tough to fix, doesn’t mean it’s impossible to fix. And it just so happens I’ve got a couple of powerful drills you can do, to help get your elbow in the right position during the trophy position phase of the swing. So without further ado, let’s dive into how to fix the trophy position on the serve. The continuous serve drill is one of the most effective drills that can help you get the arm and elbow in the right position. And on top of that, it’ll also help improve your tempo and rhythm. Start by facing the back fence, swinging your arm continuously as you mimic a relaxed service motion. The key here is to not stop your swing when you complete one motion. 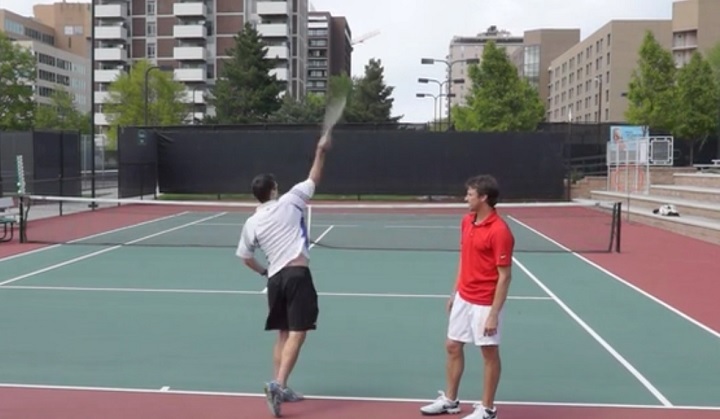 Continue to move your arm fluidly as you move the racquet back into the original starting position. Make sure that your hand is loose and the arm is totally relaxed almost like a wet noodle. If you just let your racquet move naturally, you should improve your elbow position automatically. That’s the beauty of this drill. Once you get the proper feeling of this drill, you can add a ball into the mix by swinging continuously without a ball until you are ready to toss the ball in the air and make contact. You will still swing continuously with or without a ball involved. 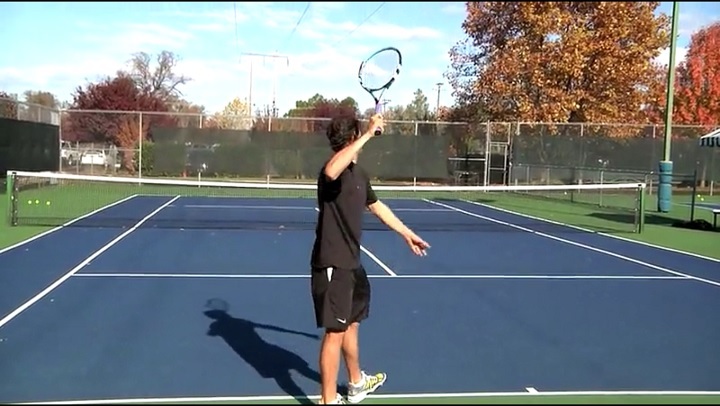 You can also hit serves into the back fence if you want to avoid focusing on where the ball might go when you hit it. Once you feel good about this, you can line up on the baseline and perform the continuous swing drill, hitting balls over the net. Just remember to still focus on being relaxed with this movement, and getting that elbow in the right place. Another great way to work on improving the elbow position is practicing the half serve progression. The racquet tip is up (above the head) and the elbow is already in the correct position, so nothing can go wrong before starting the motion. Before you start the half serve motion, you can see if your elbow is in the right position. Make sure your elbow doesn’t drop from that position as you practice the half serve. Once you feel like your elbow is staying in the right place, you can drop the racquet into what is called the 3/4 serves position. 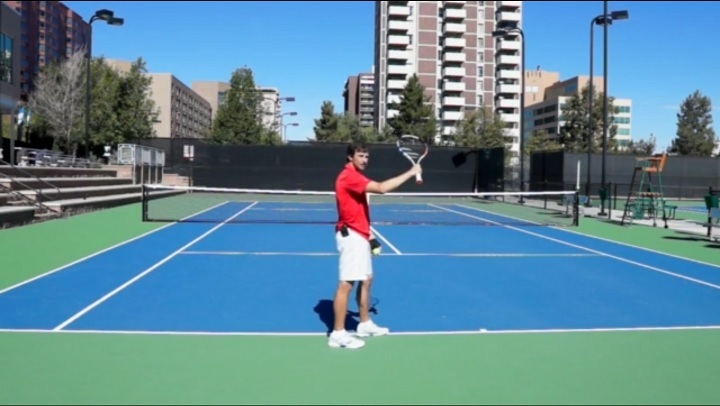 Start with your serving arm down by your pocket and the racquet face close to your knee. From there, bring the racquet up to the trophy position, and swing normally. Make sure to continue to focus on a nice high elbow position. Finally, move on to full serves. Be extra careful to prioritize your elbow position over making the serve until you really master the position. 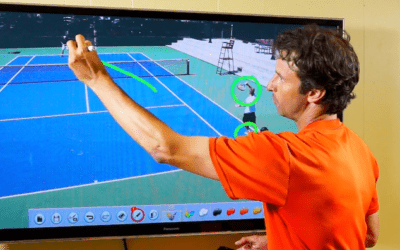 Finally, let’s talk a little bit about how to fix the trophy position on the serve using self assessment. The toughest part of these drills is being able to tell if your elbow stays up throughout the swing. There are several ways to keep an eye on this. Ideally, you can have someone watch you and give you feedback. 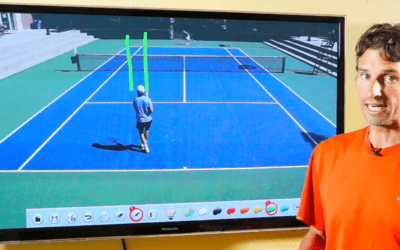 They can also film a video of your serve, so that you can look at it yourself. 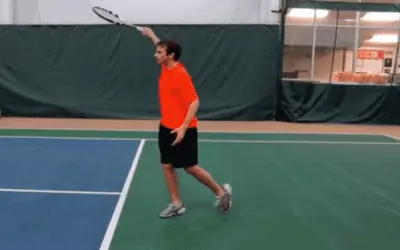 Once you get a video of your serve you can take a screenshot of your motion at the trophy position and compare it to a picture from one of my serve videos, or from a video of Federer or Sampras serving. I hope you’ve found this advice on how to fix the trophy position on the serve useful. If you combine the secrets shared above, you should quickly fix your elbow position in your trophy pose, and be hitting faster, accurate, and more effortless serves than you ever have before.